President Obama called on Americans to remain "vigilant but also be confident" in the wake of the attempted terrorist attack. (CNN) -- Kurt Haskell's eyes were locked on the seatback monitor in front of him when the words of a passing flight attendant caught his attention. "She said something smells like smoke," recalled Haskell, a passenger on Northwest Airlines Flight 253. "I got out of my seat and took a few steps up the aisle, and that's when Row 19 burst into flames." Two passengers quickly hauled the man sitting in the burning row into the first-class section. A flight attendant grabbed a fire extinguisher and put out the flames in what became the latest example of citizens taking action when counterterrorism safeguards fall short. At the time, Haskell said he didn't know if he was witnessing a terrorist attack or a freak accident. In the hours ahead, he and the other passengers learned the details of the near-tragedy. 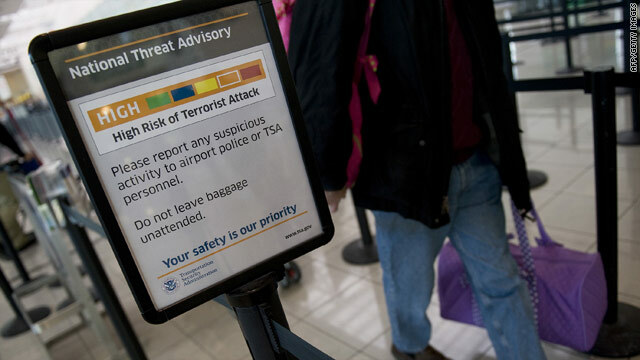 The suspect, later identified as Umar Farouk AbdulMutallab, allegedly tried to bring down the airliner with explosives concealed in his underwear. Despite warnings that he allegedly was consorting with Islamist extremists and that he was listed in a database of suspicious people, the 23-year-old Nigerian was allowed to board the plane. "We dodged a bullet but just barely," President Obama said last week. A disaster was averted by "brave individuals -- not because the system worked," he said. Brave individuals also were credited for saving the 197 people on American Airlines Flight 63 in December 2001. Passengers and crew saw Richard Reid trying to ignite a bomb in his shoe. The bomb malfunctioned, and those onboard subdued him and tied him to his seat. Three months before, on September 11, passengers overtook hijackers on United Airlines Flight 93, foiling an apparent attempt to crash the plane into a Washington target. The plane instead crashed in a Pennsylvania field, killing everyone aboard. In situations such as these, everyday people play "the most vital role" in the nation's fight against terrorism, said Bruce Hoffman, a terrorism expert at Georgetown University. "Citizens have a role and they have a responsibility, but it's the last and it's the thinnest line of defense," Hoffman said. On the front end, the counterterrorism system couldn't function without help from the public, Hoffman said, pointing to the United Kingdom's campaign against the Irish Republican Army and Israel's against the second Intifada. Signs on subways told people to be vigilant and to report any suspicious behavior or bags left behind. In both cases, "citizen tips were absolutely essential," Hoffman said. While the threat of attacks on U.S. soil pales in comparison to the Britain of the late 20th century or modern-day Israel, the United States still needs its citizens to remain alert so as to thwart terrorist attempts to establish a local base. What does it mean, everyday heroism? It means something you can do where you are, with what you've got. "More than anything else, it's an attitude that we need to have that we can't leave everything to the government to fix," Hoffman said. Temple University psychologist Frank Farley said everyday heroism is empowering for the whole culture and helps combat the "it's not my job" mentality. "What does it mean, everyday heroism? It means something you can do where you are, with what you've got," Farley said, echoing the words of Theodore Roosevelt. However, Farley, who has studied heroism for more than four decades, cautioned that overstating the threat or scaring people could counteract the public's willingness to act courageously. In his initial remarks after the attempted Christmas Day attack, Obama called on Americans to remain "vigilant, but also be confident." "This incident, like several that have preceded it, demonstrates that an alert and courageous citizenry are far more resilient than an isolated extremist," he said. Robert Heibel, a retired FBI agent who was the deputy chief of counterterrorism in the 1980s, said education can better equip the public as the nation combats terrorism. Homeland security officials need to tell people what to look for and what's suspicious. "We live in a world where our antennas need to be up," said Heibel, who heads the Institute for Intelligence Studies at Mercyhurst College in Erie, Pennsylvania. But he added that "we don't want to turn America into a vigilante society." The public needs to understand who the terrorists are and how to counter arguments made by Islamic extremists, he said. "Terrorism is not going to go away, but I think how we view this opponent, how we view the radical Islamists, has got to change," Heibel said. "We have to be able to sell ourselves better than we do. We are working against ourselves in many areas." Hoffman added that as officials work to educate the public, they face a challenging pursuit as well. "There is a very thin line between prudence and paranoia," he said. "Striking that balance is enormously important. I think that's also where our leaders and where government has a very important role to make sure we always stay on the right side of that balance."